5 Bedroom Detached House For Sale in Bo'ness for Offers Over £400,000. 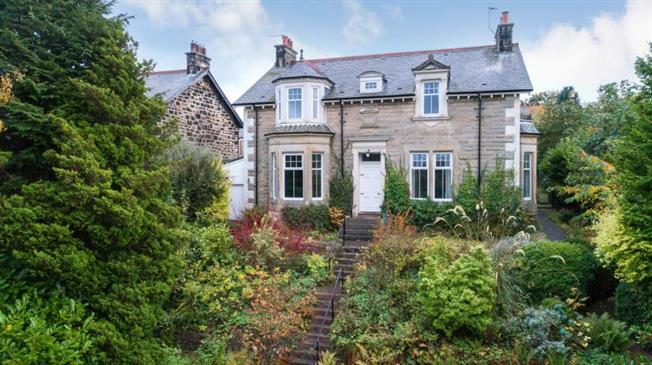 Once in a generation does a home of this size and calibre with many period features, reflecting the charm and character of a by-gone era, come to the open market. This fine family home is set in a preferred cul-de-sac location within a sought after residential locale and offers fine uninterrupted views over Bo'ness, the River Forth and towards the Ochil Hills beyond. 'Dryfemount' offers substantial and flexible accommodation that extends over two floors with possibility to extend this even further into the large floored and lined loft space with the relevant planning consents being granted. Access is gained from the rear driveway and into the sizable utility room with a separate shower room and WC off. This then leads into the generous rear facing family sized fitted kitchen complete with a fine range of base and wall mounted units and worktops. From the welcoming reception hallway, access is gained to the three principal public rooms comprising of a large front-facing bay windowed dining room with a lovely feature fire place, a substantial lounge with corner fireplace and large bay window area, with views to side and River Forth to the north and family room leading onto the rear facing sunroom. Taking the wonderful timber staircase to the half landing where the three piece family bathroom can be found and continuing to the upper landing where four double bedrooms and a further single bedroom can be accessed. The traditional features have been retained and include fabulous cornice work, high ceilings and deep-moulded skirting boards. The home further benefits from double glazing and gas central heating. The property sits on a generous plot with the rear of the home benefiting from mature gardens with an array of plants, trees and shrubs and driveway that provides off street parking and in turn provides access to the large garage. The front gardens again comprise of mature plants, lawn and well planted shrubs, with surrounding borders and summer house. Bo'ness itself offers a wide range of local amenities including excellent schooling at primary (Bo'ness Public School) and secondary (Bo'ness Academy) level, along with a selection of recreational and shopping facilities. The property is also ideally placed close to the M9 motorway for commuting to Edinburgh and Stirling, as well as Glasgow further to the west. Linlithgow is a short drive and provides mainline rail access to the main towns and cities in the central belt.